Information on the treatment of pancreatic endocrine tumours (PETs) comes mostly from small, retrospective, uncontrolled studies. Newly diagnosed, histologically proven PETs, observed from June 2004 to March 2007 in 24 Italian centres, were included in a specific dataset. Three-hundred and ten patients (mean age 57.6 years, females 46.6%) were analysed. At the time of recruitment, 262 (84.5%) underwent surgery. The percentage of operated patients was 91.9% and 62.0% in surgical and non-surgical centres, respectively. A curative resection was carried out in 83.6% (n = 219) of cases, a palliative resection (debulking) in 10.7% (n = 28), an exploratory laparotomy in 4.6% (n = 12), and a bypass procedure in 1.1% (n = 3). Laparoscopy was performed in 8.0% (n = 21) of cases. 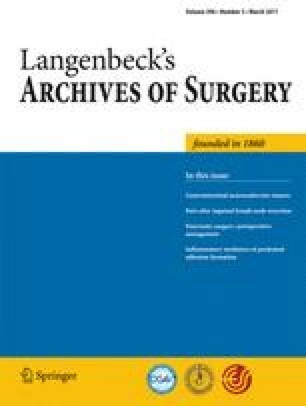 Resection consisted of a pancreatoduodenectomy in 46 cases (21.0%), a distal pancreatectomy in 95 (43.4%), an enucleation in 50 (22.8%), a middle pancreatectomy in 16 (7.3%) and a total pancreatectomy in 12 (5.5%). Liver resection was associated with pancreatic resection in 26 cases (9.9%). Post-operative mortality was 1.5% and morbidity 39.7%, respectively. A curative resection was performed more frequently in asymptomatic, small, non-metastatic, benign and at uncertain behaviour tumours, with low Ki67 values. This study strongly indicates the fact that surgical resection represents the cornerstone treatment of PETs. The authors thank Monica Simonetti and Ennio Sarli of Centro Consulenze, Firenze, Italy, for their technical and statistical support. The study was partially supported by an unrestricted grant of IPSEN Italy.